Widespread interest in Forgotify - a service that streams never-played Spotify tracks - is a wakeup call for classical music. So I'm proposing a crowd-funded streaming service called Classic Amnesia. Just as Spotify is an accurate barometer of popular music fashions, so the Proms are an accurate barometer of classical fashions. Classic Amnesia would interrogate the BBC Proms database and only play music by composers who have had less than five performances in the history of the venerable concert series. As an example Franz Berwald, a composer whose neglected symphonies memorably bridge the classical/romantic divide, would be on the Classic Amnesia playlist. Berwald has received just one Prom performance compared with 273 of Shostakovich's music. I make no claims that Berwald's music is the equal of Shostakovich's. But is Shostakovich really 273 times better than Berwald? Or is this obsession with a few composers just dumbing down by another name? 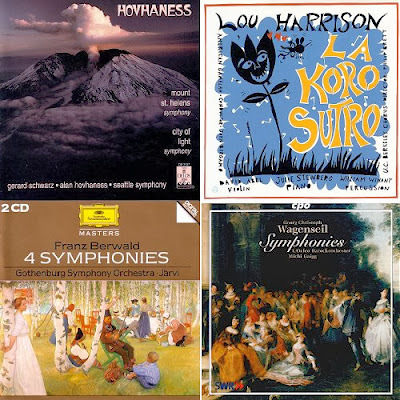 Other composers in rotation on Classic Amnesia would include the recently featured Alan Hovhaness (one Proms performance), Lou Harrison (2) and Georg Christoph Wagenseil (0). Also worth investigating is a partnership with a leading orchestra for a Classic Amnesia festival; this would be a concert series which abandons Mahler, Shostakovich, Britten and Richard Strauss for discoveries from the station's playlist. Silly idea? Perhaps, but no more silly than some of classical music's other ideas for refreshing jaded ears. Even just programming lesser-known works from the 'core' composers would be an improvement to classical radio. Shostakovich's jazzy concertos, Prokofiev's film scores, Bernstein's late concertos (post-Mass, after which his output is pretty much ignored by everybody), V-W's late symphonies, Copland's early period (or his late period - anything but the populist period), Stravinsky's late period (Agon continues to have some traction, but the choral works tend not to). In the chamber world, Bartok's solo violin sonata gets attention, but his much more experimental and modernist sonatas for violin and piano get almost no attention at all, and I personally think they're better works. at any rate, similar to how the programmed playlists for 'classic rock' have gotten to the point where unless you're the Rolling Stones, you only have one 'hit' that ever gets any airplay, many 20th century (and a few 19th) seem to only have between 2 and 5 hits that get a lot of performances and recordings (another example, the "yet another Zarathustra" from Los Angeles this month) and the rest of their output only known to those who read BBC Music's reviews looking for something, anything, new but with familiarity. It is a serious problem nowadays, and you idea is very interesting indeed! But I must say, even if I try to discover new music all the time, I was feeling so stupid by the number of composers in the very playlist I didn't know! "The standard had a salutary effect, but the result now is that the pieces of music are of necessity limited in number, and the tendency of exminees is to devote all their energies to the small number of pieces named, to the inevitable exclusion of a wide view of musical literature. For example, one movement of a Beethoven sonata will represent to the candidate's mind the whole varied range of his many sonatas, will exclude all other movements, cramp the style, and import all the faults of a fixed limitation. The musician will become a mechanician. The mechanician will have no incentive to become a musician. [...] The very excellence of the music chosen [should] be in the end the undoing of all taste for that excellence. Bach and Beethoven will become to the young and unthinking mind the musical equivalents of Czerny and bertini. The born musician will through this, the uncultured musician - and he is largely in the majority - never." Stanford probably had no way of knowing how good a composer Czerny actually was. I have great respect for Stanford as a composer and as a teacher, but his prediction doesn't really make sense to me. He seems to be guilty with Czerny of what the attitudes he notices among students with Beethoven. Technical facility develops at a semi-constant rate, while musical maturity develops in jumps and starts. I don't believe that there are many accomplished musicians who function solely as technicians. Their musical maturity might not be equal to their technique, but I hardly believe that they don't desire to have more in the way of musical insight or beauty of sound.